It’s the end of summer. Police Chief Gordon, a toad, has temporarily left his position to enjoy life a little. But he finds ‘retirement’ boring. There’s nothing to occupy his mind and time. He’s had enough of fishing. Gordon needs a sense of purpose. His best friend Police Chief Buffy, a female mouse is now in charge of the office. She is brave, with a strong work ethic. But she is lonely and alone at the station. She misses her friend, their philosophical discussions, and daily routines. There is no one to back her up when she hears scratching and grunting in the night. When two children go missing from the kindergarten, Buffy’s keen sense of smell is called upon to track them down. 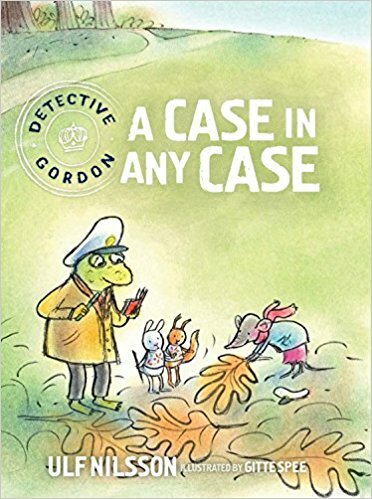 And what would an investigation be without Gordon? Clues are collected and collated. Leads are followed, and a rescue expedition is arranged. The forest animals are called upon to help. Added to Buffy’s sharp nose, and Gordon’s intellect, will they find the missing children? This delightful story has mature themes. It portrays the differences that friendships are built on, what defines community, and working as a team to solve problems. A Case in Any Case is another in the award-winning Detective Gordon series translated from Swedish by Julia Marshall. Illustrated in beautiful watercolour and pen by Gitte Spee, the endearing animal characters will win your heart as will their close friendship and warm interaction. The ideal chapter book series for independent readers.